Wes McWhorter has done weird, creative stuff for the better part of his adult life. And it was on an epic bike ride from Nashville to New Orleans that he came up with his latest crazy idea. “The long ride broke loose in me that ah-ha moment,” McWhorter says. He was surrounded by a dedicated group of like-minded cyclists united by a cause to ride over 500 miles to raise money for pediatric cancer. 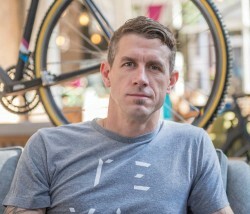 With his understanding of marketing and branding, he decided to build a business around the biking community he loved. He created a company (complete with a riveting backstory that you just have to read to believe), designed a brand and Rouler was born. While McWhorter says Rouler is not trying to be all things to all people, it sure seems like it could. Is it an apparel company? A coffee shop and cafe? A skincare product manufacturer? A race organizer? A bike mechanic? A bike maker? A community meeting space? Answer: all of the above. Rouler is a cycling-related lifestyle brand specializing in performance apparel, mechanical and fitting services, and organizing and promoting competitive and non-competitive events. Situated in the vibrant heart of the Central Business District, the brand new flagship coffee cafe and retail store invites patrons to linger and enjoy the rich cycling culture and the unique community that is New Orleans. Rouler is a true cottage industry that began three years ago at “chez McWhorter” (aka McWhorter’s kitchen table, complete with attic space for apparel storage). He started with a logo on various merchandise and some mobile mechanic work. He has slowly grown into a literal lifestyle brand based on what he and his friends like to do. “I wake up; I put on some comfortable cycling gear; I have coffee; I ride my bike; I work on my bike; and, at night, I enjoy a glass of wine with my wife, while we catch up on our day. And if I have time, I like to watch old bike races,” he says. All of that describes exactly what is going on at Rouler from 6 a.m. to 9 p.m. every day: good coffee, unique apparel and merchandise, and good company. There are three unpretentious, nutritious breakfast, lunch and dinner menus crafted by General Manager Zack Thomas, a bike enthusiast who just so happens to be a great cook. McWhorter and crew are available by appointment for bike fittings, tune-ups, and work and general consultation. His bike designs are coming soon, starting with a line of city cruisers that the Ace Hotel will rent to guests. McWhorter is also the mastermind behind the competitive cyclocross series — the Delta States Grand Prix, which includes seven races in two states — that has gone from 200 racers to 700 in just four years. He also offers noncompetitive rides like Tour du Lac, a one-day, 180-mile circumnavigation of Lake Pontchartrain.